My domains just got a little more life in them. 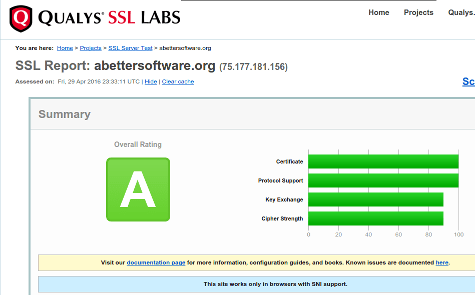 As in, an A rating from ssllabs, at least for the moment! A brave new world. I love it when a plan comes together. I’ve documented my Phabricator workflow on the wiki. It’s working great. The very-configurable workboard column configuration can make querying difficult. But epriestley works hard to keep the whole thing driving forward without it spinning into chaos. I just did a [git pull] and got the new features I was looking for that allowed me to save sort defaults for my workboards, just perfect. I’m still waiting for one more feature, but I have workarounds described on the wiki to keep my flow pretty damned tight.